According to El Comercio, these changes in the Constitution demonstrate that Ecuador seeks to distance itself from the United States’ policies of the global war against terror and the militarization of the fight against narcotrafficking. On Sunday, Ecuadorians went to the polls to vote on the country’s 20th Constitution, which has been one of President Rafael Correa’s main projects since he was elected two years ago. With 96.26% of the votes counted, the ‘yes’ vote has 64.04% of the vote and the ‘no’ 28.01%. As has been reported widely in the international press, the new Constitution concentrates power in the hands of the President, gives the President the option of running for reelection – for a total of two consecutive four year terms -, permits civil unions of homosexual couples, puts the powers of the Central Bank into the hands of the executive, and, for the first time in the world of constitutions, grants nature an inalienable right to be protected. This week, many Latin American leaders had the opportunity to speak at the United Nation’s 63rd General Assembly in New York. While the remarks of each president varied, a common thread among the speeches was the success of UNASUR and the future of regional cooperation. 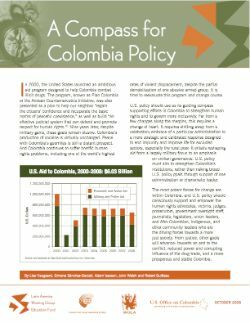 Last week, we speculated about whether Bolivia would be placed on the United States’ list of countries who have “failed demonstrably” to cooperate with U.S. anti-narcotics policy and the implications this might have, especially when comparing coca production and eradication and seizure levels of Bolivia with those of Peru and Colombia – top U.S. allies in the region. This week, the White House issued the “Majors List” of narcotics source and transfer countries for 2008, and Bolivia had been added to the “non-cooperating” list, which last year only included Venezuela and Burma. Below are two charts that lay out both coca cultivation and cocaine production levels in Bolivia since 1994. The U.N data used to create these charts show a 5% increase in coca cultivation and an increase in cocaine production from 94 to 104 tons in 2007. These numbers differ from those cited by Assistant Secretary of State David Johnson at a press conference this week, held upon the release of the 2008 list. In criticizing Bolivian President Evo Morales’ drug policies, Assistant Secretary Johnson said “The expansion of cultivation and lack of controls on coca leaf resulted in a 14% increase in the area of coca under cultivation, and an increase in potential cocaine production from 115 to 120 metric tons.” Regardless, while these numbers do show a rise in the amount of coca and cocaine in Bolivia, the increases are not outstanding, especially in comparison to Colombia and Peru’s cultivation and production numbers. The United States recalled Ambassador Goldberg in reaction to the protests. In reaction, the United States removes USAID personnel from the Chapare region, while President Morales praises the coca growers for kicking out the U.S. agency. September 11, 2008: President Morales again accuses Ambassador Goldberg of working with the opposition, and orders the U.S. Ambassador to leave Bolivia. In ‘solidarity’ with Bolivia, Venezuelan President Hugo Chávez also orders the U.S. Ambassador to leave his country. The United States reacts by expelling the Bolivian Ambassador. Drug related violence in Mexico has killed over 2,700 people this year. Just this week, over 30 people have been found dead: 24 of whom were found in a mass grave, bound and shot execution style, and 7 of whom were killed yesterday when a grenade exploded at an Independence Day celebration in Michoacán. Not only do we need to pay attention because of the role U.S. money and arms trafficking plays in the violence, but we should also be following this closely because of the $400 million in aid, known as the ‘Merida Initiative,’ destined for the Mexican government that Congress approved in June (here is a a breakdown of aid for the Merida Initiative from 2007). A large percentage of this money will arm and equip the Mexican military in its fight against narcotrafficking. Critics like the CIP Americas Program, Amnesty International, LAWG and WOLA have argued that strengthening Mexico’s institutions, especially the police force and the judicial system, and addressing the military’s human rights violations should be the top priorities for Mexico and any aid from the United States. Yesterday, the Los Angeles Times published an article on Mexico’s various police forces, citing that a reform has begun, but that there are still inherent problems that make the police a very corrupt institution trusted by few Mexicans. In a video that goes along with this article, the Mexican citizens interviewed all cited lack of education, low wages and corruption as the main problems that must be addressed within the police force before violence will diminish. With 25,000 federal police and over 350,000 state and local officers, it will be difficult for Mexican President Felipe Calderón to overhaul the entire police system. However, until corruption can be rooted out of the local and state police forces, it may prove difficult for U.S. aid to have a significant impact on the increasingly violent drug war next door. Every year, the President is required by the Foreign Assistance Act of 1961 to submit to Congress an annual report identifying (a) major drug-producing or transit countries and (b) those countries not “cooperating” with U.S. counternarcotics measures and subject to sanctions. Using the “International Narcotics Control Strategy Report” published by the Bureau for International Narcotics and Law Enforcement Affairs (INL) every March, the “Majors List” is compiled each year and presented to the Secretary of State for consideration before being approved by the President and sent to Congress. Under President Evo Morales, Bolivia has adopted a “zero cocaine, but no zero coca” policy, allowing for the cultivation of nearly 30,000 acres of coca for traditional uses, a policy which, according to Reuters, the United States has described as “permissive.” However, the United States has started to critize Bolivia’s drug policy as a result of a recent UN report on coca cultivation in the Andes region, which measures the cultivation in Bolivia increased by 5% in 2007 and covers 71,660 acres. A recent article in El Espectador shows that despite the increase in drug-seizures in Bolivia from 18 tons in 2007 to 19.5 tons between January and August 2008, the U.S. government “considers that the increase in confiscations only is proportional to the increase in the production of coca” and the New York Times quoted a U.S. official saying “Let’s put it this way: [Bolivia’s] going in the wrong direction,” in reference to Morales’ drug policies. While coca cultivation in Bolivia did increase in 2007, the UN report shows that coca cultivation also increased by 27% in Colombia and by 4% in Peru, two of the United States’ main allies in the region, while confiscations increased 29% in Bolivia and decreased by 9% in Colombia and 30% in Peru. Bolivia remains far behind Colombia in increased coca cultivation and has improved its capacity to confiscate drugs in route, yet Bolivia is still being scolded by the United States. You can read more of the recent coverage of the United States’ criticism of both Venezuela’s and Bolivia’s drug policy here. On October 16th of last year, Adam Isacson wrote a piece on the blog Plan Colombia and Beyondabout the potential of a third term for Uribe. At the time, the “Party of the ‘U'” had promised to collect the 1.3 million signatures necessary for a petition to amend Colombia’s constitution to allow Uribe to run for again in 2010. In this post, Adam outlined how Uribe running for a third term could actually make the work of CIP, which is often critical of Uribe’s policies, far easier. Now, almost one year later, the debate continues, the “U” Party has successfully collected 5 million signatures in support of a constitutional amendment and Uribe’s approval ratings have soared over 90% in the wake of recent successes against the FARC (today, an article in El Tiempo noted that Uribe’s approval rating has recently dropped to 78%, due to rising inflation and perhaps discomfort with Uribe’s face-off last week with the Supreme Court). The New York Times, the Los Angeles Times and the Guardian published articles last week that touched on the reelection debate and gave reasons why Uribe should not seek a third term. Thanks to a Freedom of Information Act request from the Federation of American Scientists’ Arms Sales Monitoring Program, we now have data about weapons and equipment that the U.S. government sold to the rest of the world through the Foreign Military Sales program in 2007. [PDF] March 2006 PowerPoint presentation from Thomas W. O’Connell, assistant secretary of defense for Special Operations and Low Intensity Conflict.